How classy is this invitation suite from Soiree and Showers and Four Things Paper? 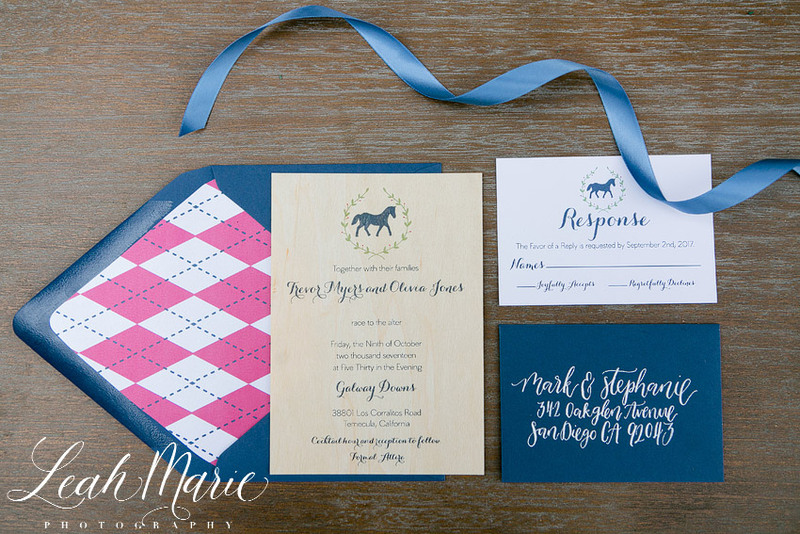 The pink and navy diamond pattern in the envelope is so fun and the horse embellishments add the final Derby touch. And it wouldn’t be a Derby party without a julep! We did a modern twist on the traditional mint julep with this peach ginger julep bar complete with Maker’s Mark bourbon. And can we talk about this velvet dusty blue lounge from Madam Palooza? Because we are OBSESSED! We’ve been seeing more and more of the dusty blue color and we are loving it! As always Laura Marie’s delivers with this STUNNING three tiered cake! The floral display at the top? Not real flowers but made from fondant! We’ve said it once and we’ll say it again Laura is the Vera Wang of the cake world! I mean these florals look so lifelike! Galway Downs is a gorgeous property and it doesn’t take much to make it wedding ready. Adding in simple florals and maybe a fun ceremony backdrop like this white door from Madam Palooza and voila, you’re ready to get married! For our bride and groom we wanted to stick with traditional Derby attire but still keep it wedding themed! The wedding gown is from Bridal and Veil and the suit is from Friar Tux. We kept with the navy and pink color palette with the groom’s attire and of course classic khaki pants. For the bride we wanted it to be very soft and romantic and the bright bouquet finishes off the going to the races look! How stunning are these florals from MFG Floral Designs?! From the bold pinks and lush greenery to all the texture in the florals these centerpieces are just perfection! In sticking with the navy theme the always fabulous Michelle of Michelle Garibay Events styled the tables with fun pops of blue in the napkins, tumblers and candlesticks. I mean who wouldn’t want to have their wedding here? It’s a photographers heaven with all the dreamy locations and natural landscapes! And it’s just enough rustic without feeling like you’re getting married in a barn with chickens all around you. Soiree and Showers absolutely nailed it with the ribbon seating chart! Seriously so cute!! And it wouldn’t be a true Derby shoot without a big hat and a horse! 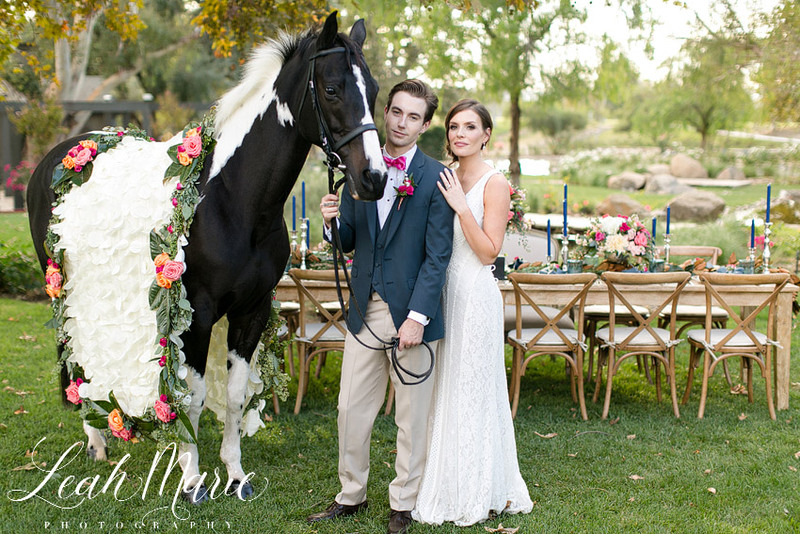 We had so much fun with this shoot and couldn’t have done it without our amazing vendors!